Most manufactured homes, except for those placed over basements, have an area under the home and above the ground that in most cases should be ventilated. 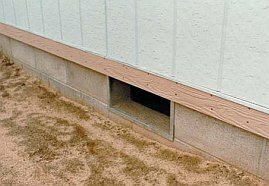 The primary purpose of crawl space ventilation is to minimize the accumulation of moisture under the home. Excessive moisture accumulation under any home can create an ideal environment for moisture seepage into the home itself. The manufacturer's installation instructions spell out the amount of open vent area that must be provided per square foot of home. Further, most instructions require even distribution of the vents, and allowance for cross ventilation. Local building codes also dictate how much ventilation is required. A very good technique for minimizing moisture accumulation under the home is to place a continuous polyethylene sheet of at least 6-mil thickness on the ground below the home. The barrier blocks moisture in the ground from entering the crawl space (see picture at right). On top of that, a moisture barrier allows you to breathe higher quality air in your home. How is that? Well, the air in your home going through a cycle. The air that you're breathing in your home was once in your crawlspace. In fact, studies have shown that in some cases up 25 to 40% of the air inside your home was once in your crawlspace. It is being sucked up into the top levels of your home where it eventually escapes. Moist, dirty air from your wet crawlspace is what you and your family are breathing inside your home. 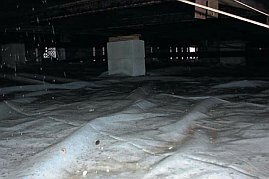 But if you have a crawlspace moisture/vapor barrier installed, the air that is being sucked up from your crawlspace is much cleaner and healthier for your lungs. Proper site drainage is also essential to prevent water from accumulating in the foundation area. Grading is the most effective tool for keeping water away from a home. This can be achieved in two ways. First, if new lots are being created, the grading plan should elevate each home to promote water flow away from the home. This may not be an option if the home is placed on an existing lot. Second, once the home is in place, final grading, normally in the form of backfilling against the foundation wall, should slope away from the home for a distance of 3-5 ft (local code requirements should be checked). To supplement proper grading, many builders add gutters and downspouts to remove rainwater from the roof and divert it a good distance from the foundation.